Puffin is one of several lovely apartments at Pandora Court in Woolacombe with the benefit of just a 5 minute stroll to Woolacombe beach and village. Stunning views can be enjoyed from both the open plan/kitchen/dining/living room/balcony and the master bedroom. There is WiFi, parking and a balcony which makes this combination very popular with Woolacombe visitors. This apartment is well thought out with a wooden fronted kitchen and dining area leading into the seating area with door to balcony so this really is the heart of this holiday home. 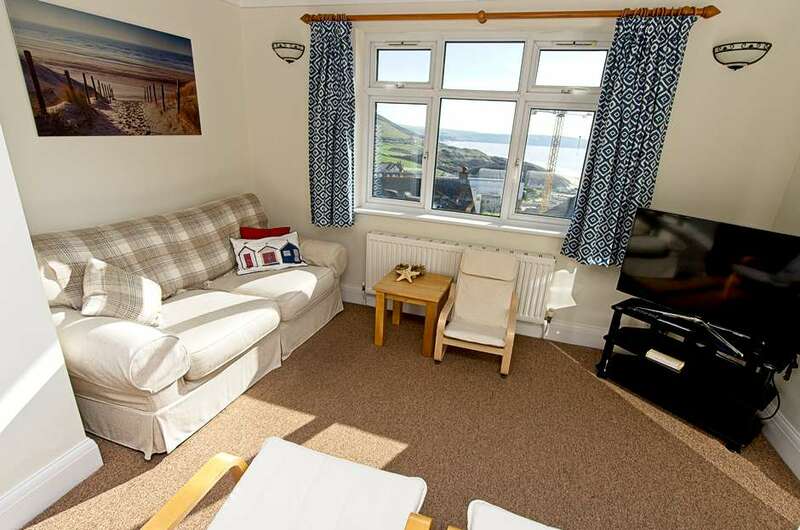 The two bedrooms are comfortable and the master even has access to the balcony which overlooks Woolacombe Bay! The kitchen has all appliances, a fridge, freezer, oven and hob, washing machine, dishwasher and microwave. There is a small wood burner more for ornament than use. In the cosy lounge area are two armchairs and a sofa, coffee table and TV. I love the master bedroom as it has good light, a kingsize bed, an amazing view, is reasonably spacious and has its own en-suite. The twin room at the back is cool, quiet and relaxing. Both have ample clothes storage. All on one level once within the apartment it has a family bathroom also off the hallway with white suite with bath with mixer taps and telephone style shower attachment (not for stand up showering). Puffin makes a wonderful holiday home to relax before sampling all that Woolacombe has to offer and then provides a great base to return to after exploring the coastline or having enjoyed a beach day on Woolacombe beach voted the UKs best beach by people on TripAdvisor.